There are so many amazing things to do in Nassau, and one of visitors’ all-time favorites is heading out to sea on an exciting snorkeling or diving tour. Not only can you swim among some of the ocean’s most fascinating creatures, but you may also spot assorted dolphins and whales en route to your diving spot. One of the most intriguing of these marine creatures is the enormous sperm whale, long hunted for its blubber, oil and spermiceti. Easily recognized by its huge head and massive rounded forehead, this leviathan has the biggest brain of any animal ever to have inhabited the earth. 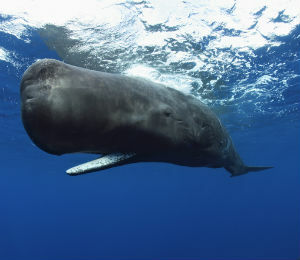 Largest of the toothed whales, the sperm whale can reach lengths of over 65 feet and weigh upwards of 35 to 45 tons at maturity, with males up to three times as big as females. The species’ massive, block-shaped head represents up to one-third of the entire length, and its light brown to brown-gray back skin is very wrinkly, making individuals easy to identify from above. Its triangular, thick flukes are very flexible, enabling the animal to propel itself downward in deep feeding dives. Instead of a dorsal fin, the sperm whale has a series of ridges on the back, with the largest often referred to as a hump by whalers. The blowhole is uniquely skewed to the left of the head. Feeding almost entirely on squid, these giants are able to dive as far into the ocean depths as 3,000 feet in search of food, holding their breath for up to 90 minutes. Other food includes octopus, fish, crab and shrimp. Between dives, the whale must breathe on the surface for about eight minutes. Food is located by a form of echolocation, a clicking sound that is considered the loudest sound produced by any living creature. Possessing the longest intestinal system in the animal kingdom, sperm whales intestines can be close to 1,000 feet long, and it has four stomachs, each with a specific function, including crushing (they cannot chew) and digestion. A healthy adult sperm whale has few natural predators, though distressed adults and calves may be attacked by pods of orca whales. From the early eighteenth century up until the late 20th century, humans were the sperm whale’s most formidable enemy, as they were intensely hunted for spermaceti, the liquid inside its brain, which was used in oil lamps and candles. Even today, a digestive waste product from the sperm whale, called ambergris, is used by the perfume industry. These mammoth creatures can be found in open oceans around the world, with only males living in the higher latitudes. Once endangered by extensive commercial hunting, the species has grown much stronger, with worldwide numbers now thought to be in the hundreds of thousands. Pods, normally numbering 15 to 20 individuals, include females and their calves as consistent members, while males of the species may move among groups or travel solo. Females give birth every four to twenty years and need to care for their calves for over a decade, and the species as a whole has a potential lifespan of up to 70 years. Find out recent news on the Top things to do in the Bahamas, or learn about the history and wildlife. Check back often for all your Bahamas needs.